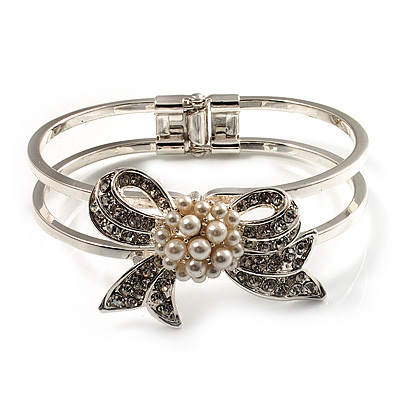 Add exquisite elegance to your ensemble with this Prom Crystal Pearl Bow Hinged Bangle Bracelet. Featuring a charming bow design, crafted in rhodium plated finish and accented with clear crystals and snow white faux pearls, offering a dazzling look. The bangle is hinged and measures about 13mm in width, will fit up to 19cm wrist. The bow motif measures about 4.5cm x 3cm.